MOLLY’S GAME is writer Aaron Sorkin’s directorial debut. 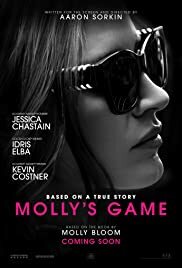 Sorkin also adapted the script from the memoir Molly’s Game: From Hollywood’s Elite to Wall Street’s Billionaire Boys Club, My High-Stakes Adventure in the World of Underground Poker by Molly Bloom. Anyone familiar with Sorkin’s work, the most notable being the script for THE SOCIAL NETWORK will surely know that a lot of dialogue is expected and the actors in the film have to be motor-mouthed to be able to speak Sorkin’s dialogue at hundreds of miles per hour. Lead actors Jessica Chastain and Idris Elba do just that and supporting actor Michael Cera known for his fast speaking does the same. MOLLY’S GAME is stud poker. It would be beneficial if one knows the rules of the game in order to appreciate the film. There are suspense scenes involving being dealt the winning card and if one is unsure whether a full house or a royal flush wins, then one might do better to learn the rules of poker before venturing into a poker film. Besides the fact, Sorkin has done his homework on high poker stake games around the world and what transpires on screen in extremely credible. No doubt the memoirs must have have been quite detailed. There will undoubtedly be those who will complain about the film being too talky. But this is the niche of watching an Aaron Sorkin film – script or direction. Sorkin has the gift of words and though the film is talky, he is to be given credit for a fast moving 140 lengthy film. His attention to detail is an additional bonus. Sorkin’s both subtle and over-the-top humour is also present. This can be observed in the detailed and lengthy 10 minute introduction to the film where the voiceover announces that the Molly’s skiing has nothing to do with her poker. The film then establishes from scratch how Molly enters the game and finally how she becomes super good at ti before it all crumbles. Then the biggest joke is that all this is revealed at the film’s end to be caused by skiing after all – to be due to that twig that trips Molly during her final ski jump. In the story, the FBI presses Molly to reveal the high profile players so that they can be investigated leading to persecution. Molly sticks to her principles against her lawyers advice. Yes, this leads to more verbal debate! Sorkin stays true not to reveal any big names in the film as well. As in the other Sorkin scripted films, the dialogue goes on so fast that one can understand 20% of its if lucky. But Sorkin has the gift of making the audience feel as if they have understood everything necessary for the film to go on. Sokrin’s scripts and MOLLY’S GAME, his first film are strong on his style of writing. To be fair to him, his story gets through and the film moves fast, at times as fast as the dialogue. But if one wants to complain about this, stay away from this film. 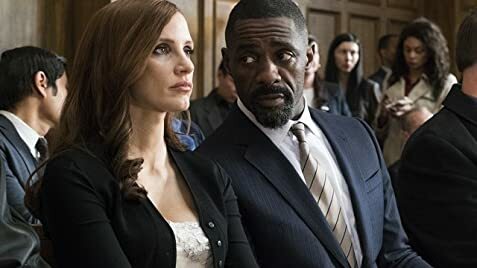 MOLLY’S GAME premiered at the Toronto International Film Festival to mixed critical reviews. Love it or hate it, but the Sorkin dialogue film has its pleasures. [on the differences between him and his character Stringer Bell from The Wire (2002)] Stringer is very calculating and he has to be for so many reasons. He’ll calculates the next steps, shipments, inventory, pays workers… all that. But the wicked part is that he can plan murders because that’s a part of his business. I’ll tell you, if I, Idris, had to contract for murders as part of my job, I couldn’t do it because I have a heart. I have no stomach for ordering other people’s deaths. Stringer just gets in there, orders the deed and bam… that’s it… it’s done and he doesn’t think twice about it. There’s no way I could be that cold. I’m also a more lively kid out there, doing stuff and I can’t just do one thing forever. Stringer is committed to his job and business so much so he doesn’t have much of a personal life so he’s more one dimensional. As for me I have a child, a life, thirst for travel, you know I’m curious… whereas Stringer is more interested in being the best business person and his interests don’t go further than that.